PYLA Stylish Studio Apartment. Sleeps up to 2 from €195 p/w. A delightful two bedroom apartment in a fantastic location, just a few minutes stroll to Nissi beach, one of the best beaches on Cyprus. There are many tavernas, bars, supermarkets and much more close by. This is an ideal location for a relaxing holiday, whilst being only a few minutes by car, scooter or quad bike to the bustle of Ayia Napa town centre and the marina. The accommodation comprises a spacious open lounge and dining area with large patio doors to the veranda with views of the communal pool. The lounge has comfortable sofas and furnishings, television and DVD player. The fitted kitchen has all the home-from-home appliances including washing machine, fridge-freezer, oven and hob. The master bedroom has a double bed with patio doors to a large balcony, and the second bedroom has two single beds. Both bedrooms have ample wardrobe space. A hairdryer is also available. A family bathroom has both a bath and overhead shower. There is a large communal pool with changing room and WC facilities. If you are interested in renting property 1125, please fill in and submit this form and we will contact you shortly, or please use our contact form if you also want to send us a message, quoting Ref 1125. Thanks to its golden sandy beaches, the Ayia Napa coastline attracts a large number of tourists. Watersports are very popular here, such as water-skiing, windsurfing, canoeing, scuba diving and speed boating. The Cyprus Tourism Organization supervises the Ayia Napa beaches and is responsible for protecting the interests of all tourists. All beaches in Ayia Napa have been awarded with the EU blue flag for their level of cleanliness and the comprehensive facilities offered. The Square in Ayia Napa, central to the town, is filled with restaurants, nightclubs and shops; for many it is seen as the focal point of Ayia Napa nightlife. Cape Greco, considered the most beatiful place on the island, is a 15 minute drive from the centre of Ayia Napa. 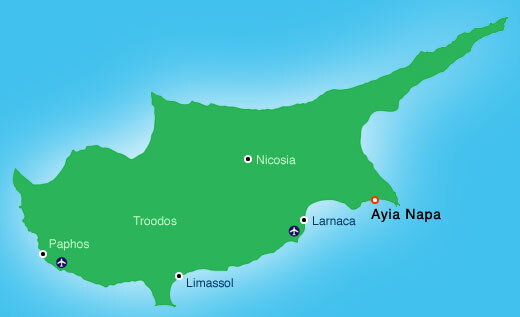 Ayia Napa is also spelled as Agia Napa.